how they define and use their living spaces. GROHE has identified five mega trends: Consumers have risen from passive consumption to taking control over the creation of new living spaces and have become creators themselves in seeking simplicity and intelligent product solutions. Today, more than ever, product innovation and design depend on an empathetic understanding of these trends as consumers are inclined to choose integrated solutions over single products. GROHE, a leading global brand for complete bathroom solutions and kitchen fittings, gave an impressive account of its journey in reflecting the five mega trends in its offering to consumers and customers during its keynote event at yesterday’s start of the ISH trade fair in Frankfurt, Germany. 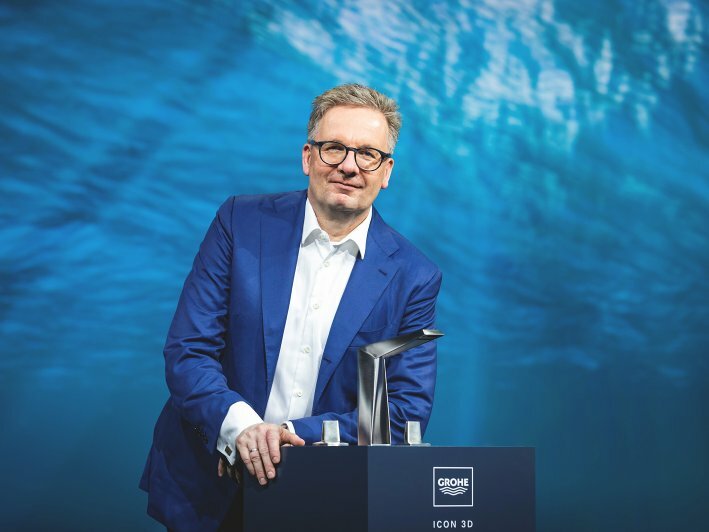 With a record number of 500 single new products GROHE surprised its customers and consumers with solutions that actively shape the future of water. The boundaries between the individual living areas are becoming more blurred. The kitchen is often part of the living room, the bathroom opens up to the bedroom and both are becoming important living spaces instead of purely functional ones. When designing their own living space, consumers pay much more attention to detail in the bathroom and the kitchen than ever before. Consequently, bathroom and kitchen products have become household furnishings that allow consumers to express their individual style and preferences. As the first European leading sanitary brand to launch 3D metal-printed faucets, GROHE breaks with the old principle of form following function and combines cutting-edge technology with spectacular design. It is an impressive statement of GROHE’s willingness and ability to shape the future of water and accompany its customers and consumers on their journey to create the living spaces they desire. “Consumer expectations are changing to a great extent”, said Michael Rauterkus, as he delivered his keynote speech in front of 350 international journalists and invited guests. “GROHE is shaping the future of water, in terms of design and innovation, both analogue and digital, giving our customers and our consumers the building blocks they need to harness the power and the beauty of water – as a tailored experience wherever they enjoy water.” Whilst new living spaces evolve around the bathroom and the kitchen, consumers are often confronted with an unwanted complexity in the creation process. The search for simplicity in terms of easy and intuitive solutions is met with a new minimalism to people’s homes. GROHE clearly positioned itself as a leading global brand for complete bathroom solutions, supporting consumers in becoming creators without having to deal with complexity. Its products combine quality with a stunning range of colors and materials: from faucets, showers and ceramics, to kitchen faucets, sinks, accessories and flush plates. “Nobody else offers, across the whole product range, the quality and durability in so many colors that bathrooms and kitchens require”, emphasized Michael Rauterkus. Essence, GROHE’s newly introduced and first ceramic line that includes bathtubs, is a perfect showcase of the new minimalism and search for simplicity, showing beauty in its purest form. The design line’s characteristics are its gentle organic forms that are based on their reduction to the essentials. But minimalism by GROHE goes far beyond design, it means also the intuitive handling and easy installation of products. The new GROHE Rapido SmartBox provides architects, planners and installers with an infinite number of possible solutions with just one concealed installation solution: For maximum efficiency and planning flexibility, the concealed installation can be combined not only with the innovative shower system GROHE SmartControl but also with thermostats and single-lever mixers, offering a universal solution for all requirements. At ISH two years ago, GROHE launched its first Internet of Things (IoT) solution, GROHE Sense and GROHE Sense Guard. Today, GROHE is pioneering digitization in the sanitary industry and extends its competence well beyond sanitary hardware solutions. At the ISH 2019 keynote, GROHE announced a new generation of GROHE Sense water sensors and the launch of GROHE Sense Guard Pro, which is optimized for use in multi-family homes and high-rise residential buildings. Installed on both the cold and hot water pipes, it offers water security and provides accurate water consumption data directly onto mobile devices via the GROHE Sense App. This also means that there is full visibility of water and energy consumption, allowing consumers to take control. Moreover, with the combination GROHE Sense Guard and Sense Guard Pro, the global brand is now able to help prevent water damage in 90 percent of the residential market. 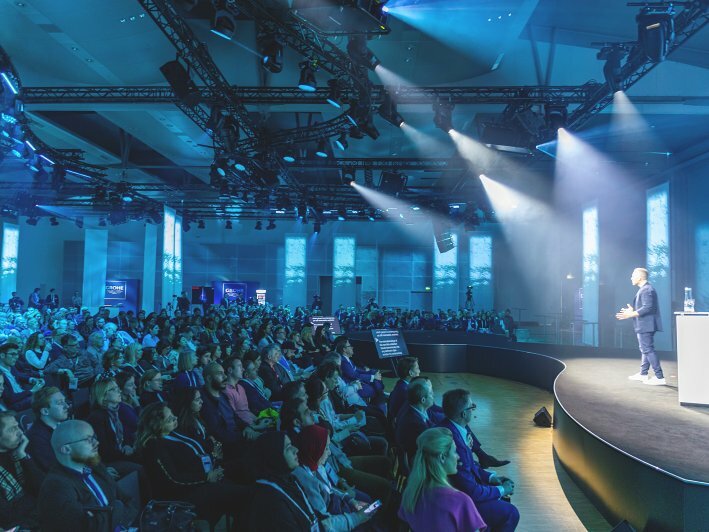 The GROHE Sense system has created a disruptive new business model for GROHE as well as for installers and new business partners such as insurance and property management companies. 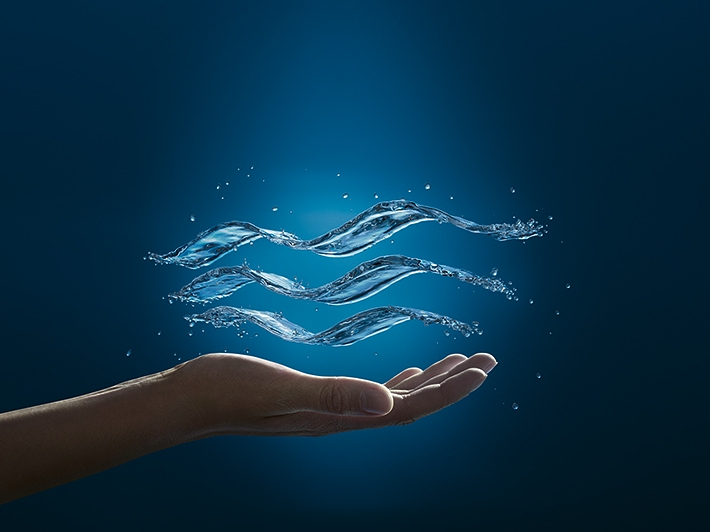 “We are creating an intelligent platform, the biggest ecosystem for water security and water management, which will allow our industry partners worldwide, such as insurance companies, to implement new business models”, said Michael Rauterkus. 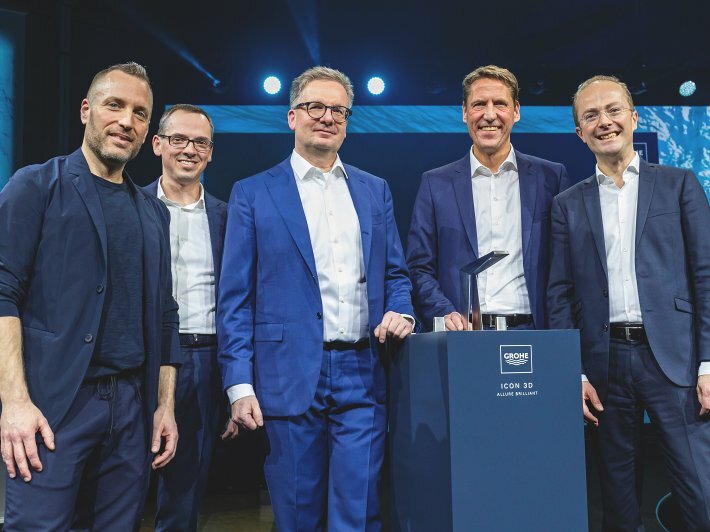 GROHE presents the Icon 3D, its first 3D printed faucet using GROHE’s proprietary metal granulate, as the ISH 2019 trade fair in Frankfurt/Main, Germany gets under way (from left to right: Michael Seum, Vice President Design, Bert Depiere, Director Digital Innovations, Michael Rauterkus, CEO, Thomas Fuhr, Executive Director Operations, Gerhard Sturm, Chief Marketing Officer). Michael Seum, Vice President Design of GROHE, presents the Icon 3D, GROHE’s first 3D printed metal faucet, as the ISH 2019 trade fair in Frankfurt/Main, Germany gets under way.